Ahh Spring. It's here in every nook and cranny. This is the time of year that I cut way back on the cooking and focus more on assembling with the prettiest ingredients I can find. I've mentioned in a previous post that I've got an obsession with quail eggs. This recipe came together after a fun romp through my friendly vegetable shop. Radishes, butter lettuce and chervil all looked beautiful so I loaded up with the intention of putting together a salad. I had dreams of making a garlic aioli as the dressing, but as I was dragging out all the equipment, I realized that my ambition far out-stripped the time allotted for assembling my lunch, so I opted instead for my normal low-key trickery of using yogurt. I loaded it up with lots of grated garlic and dill. Putting the yogurt together is about as hard as this recipe gets. 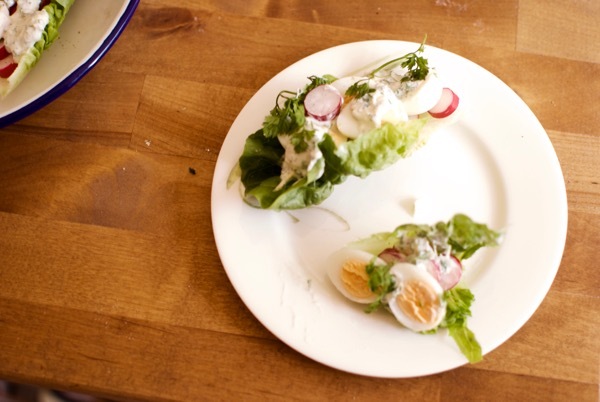 Once the quail eggs are done cooking, you peel, slice it, stack it, dollop, and let the chervil rain. You can definitely devour a whole plate of these wraps. They make a really satisfying lunch that's fresh and zingy and best of all really good for you. Quail eggs are actually like little health super bombs with more protein and more vitamin B1 than chicken eggs. I find the yolks are creamier and richer than chicken eggs as well. If you can't get your hands on the quailies, then by all means, go for chicken eggs, or even shredded chicken breast. Bring a pan of water to boil. Carefully drop the quail eggs in and once the water has returned to boil, cook them for 4 minutes. Drain and place the eggs in an ice bath. While the eggs are cooling, grate the garlic and chop the dill. Stir these both into the yogurt with a pinch of salt and few grinds of pepper. 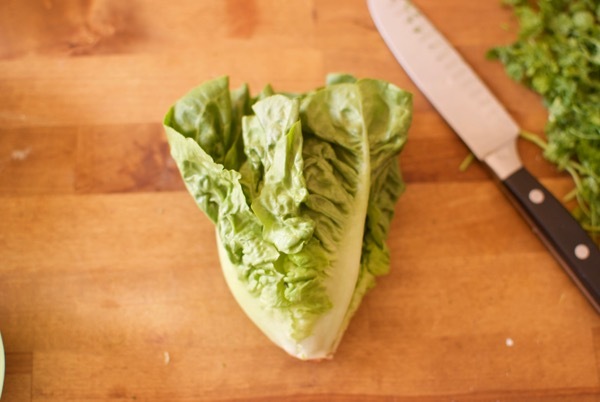 Break the head of lettuce up and wash the leaves and the radishes. Slice the radishes, some like them very thin, I like them a bit more chunky. Chop the chervil. Once the eggs are cooled, peel the shells and cut them in half, length-wise. Place the lettuce in a layer on the plate. 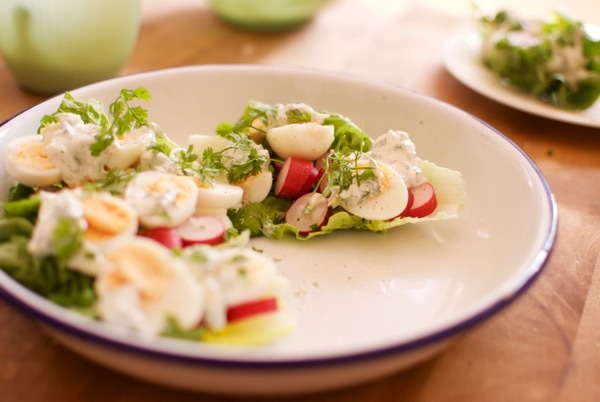 Top with radishes, eggs and dollop the yogurt. Sprinkle with a little more salt and pepper and the chervil. Try not to scarf them down too quickly.